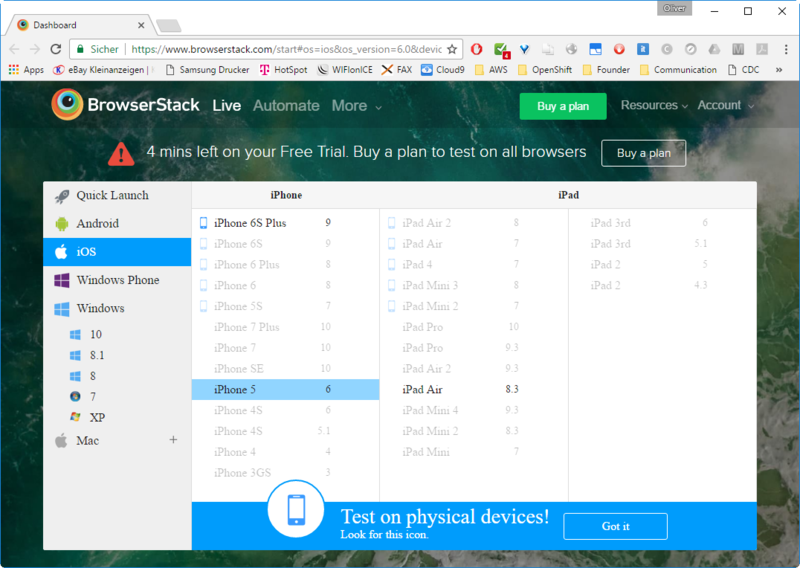 With the BrowserStack cloud-based solution, there is no need to buy many different hardware types for testing your website for many different mobile devices and operating systems. 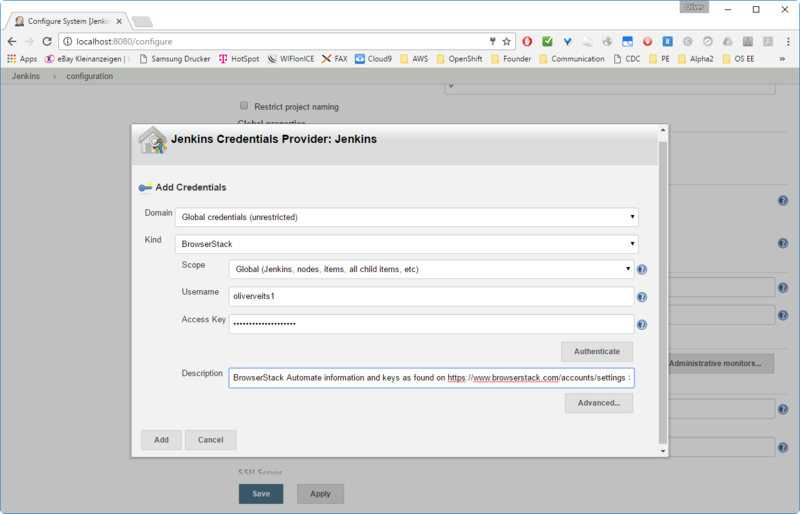 In this blog post about Jenkins BrowserStack Integration, we will learn how to integrate BrowserStack-based automated cross-browser tests into a continuous integration workflow controlled by the popular Jenkins tool. 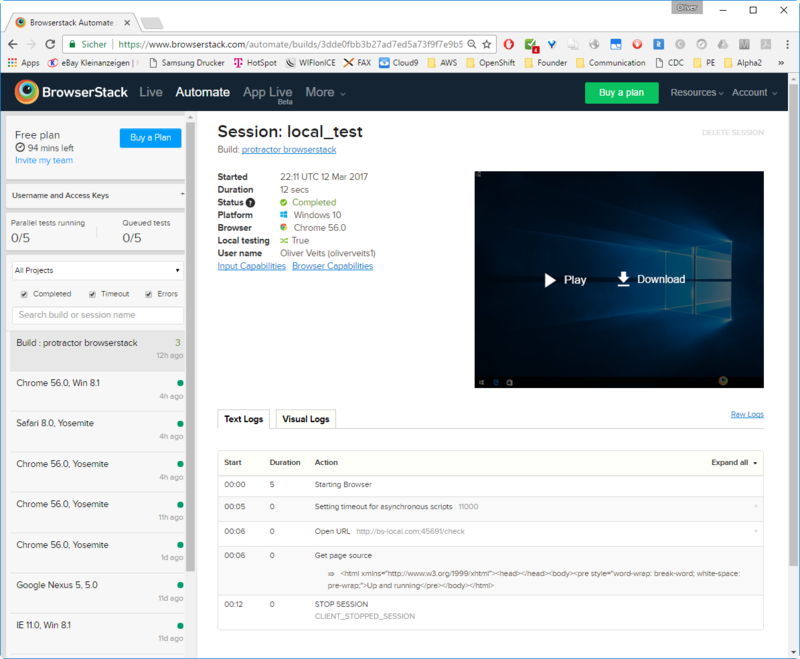 First, we will demonstrate how to use BrowserStack manually, before we automate the browser tests with the help of a Protractor Github example from BrowserStack. 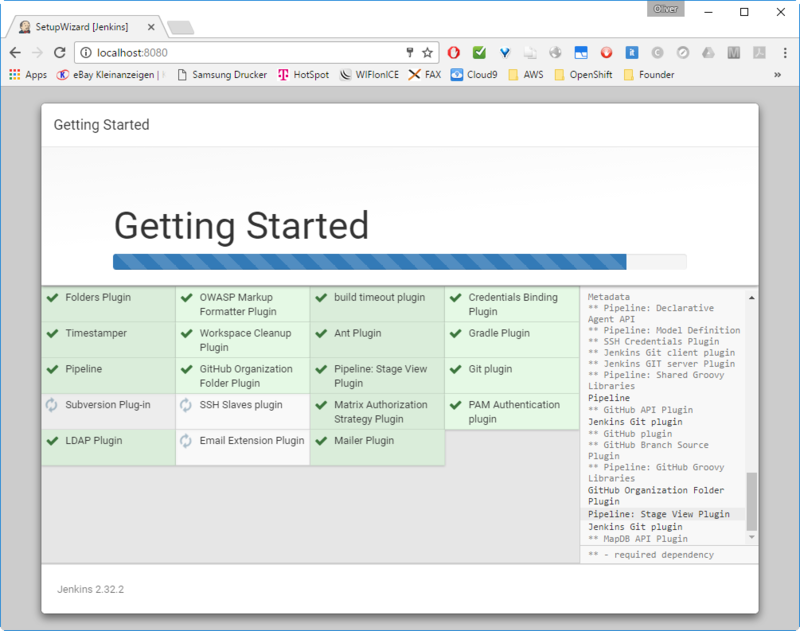 You will need to sign into a BrowserStack trial account with 30 minutes free manual testing and 100 minutes free automated testing. For this tutorial, we will need less than 6 minutes of automated testing time. 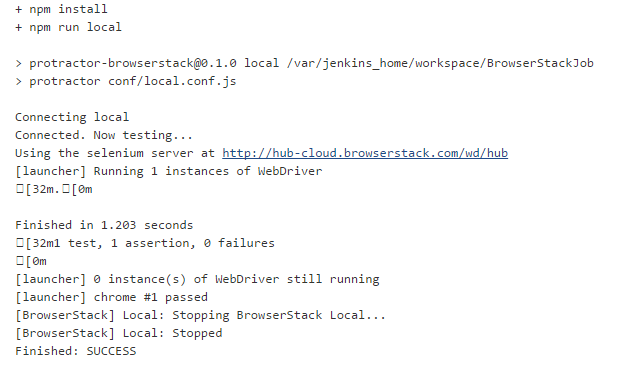 Moreover, we will integrate the BrowserStack based tests into a Jenkins build job. 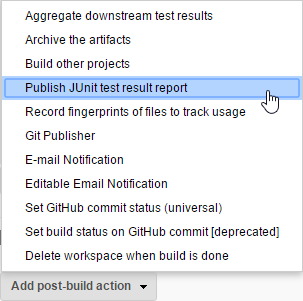 In the end, we will generate individual and trend Jenkins test reports with the help of the Jasmine reporting tool. Note: The difference to my previous blog post is, that I have concentrated on Protractor without Gulp on Ubuntu this time. 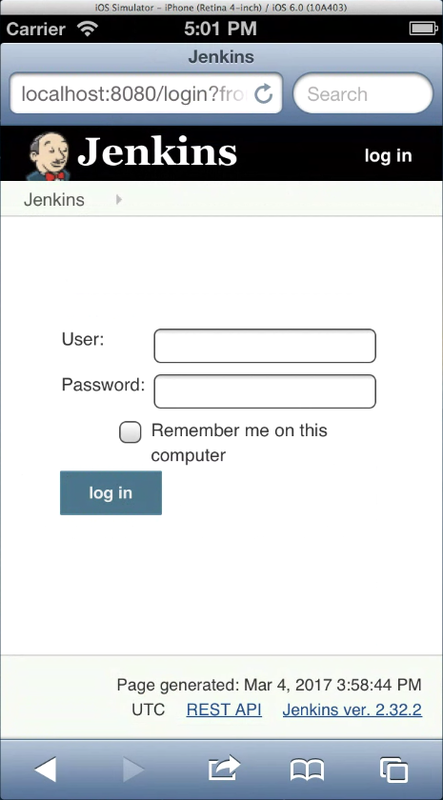 More importantly, I have added the Jenkins integration. In addition, you will find the description of many possible errors and their resolution in the appendix. Docker Host is available. If not, follow the “Prerequisite Step” below. Tested with 2 vCPU (1 vCPU might work as well). 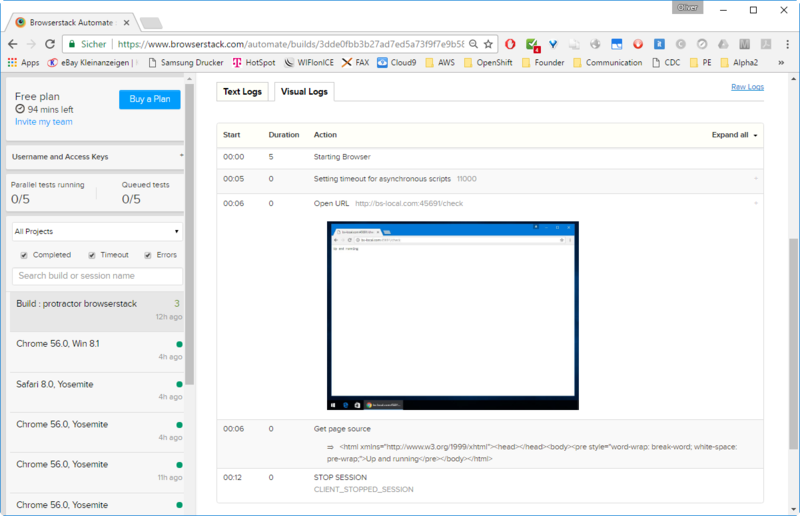 After signing up for a BrowserStack account, you get a 30-minute free live testing session. Start a local browser, and connect to the BrowserStack start URL. You will be asked to install a Browser plugin, which will take the role of a BrowserStack client. As you can see, I have typed in localhost:8080 on the remote iOS simulator running on the BrowserStack cloud. 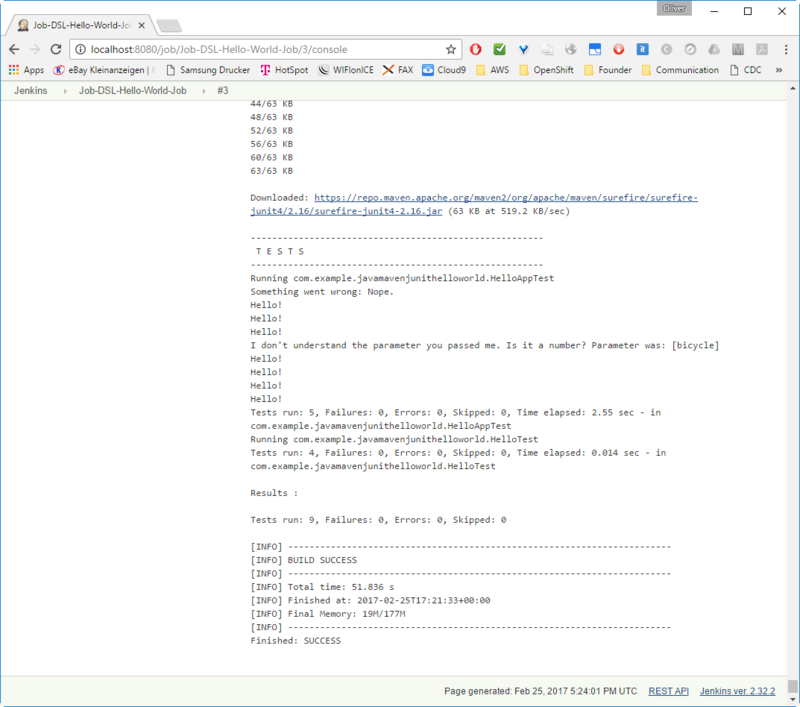 However, the browser is loading the Jenkins server page, which is running on my local notebook. The browser does not try to really load localhost (i.e. the iOS the browser is running on). Instead, the HTTP request is directed to the locally running Chrome plugin, which is then resolving the DNS name “localhost” locally. This is called local testing, which we will explore in more detail now before we start our step by step guide. 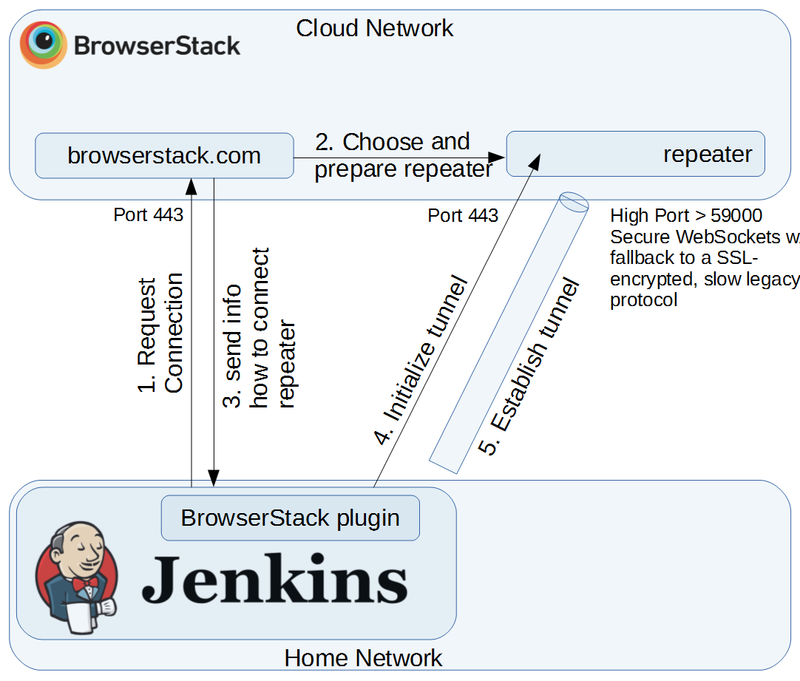 Steps to run a browser in the BrowserStack Cloud. All requests from the browser are proxied by the repeater and the BrowserStack client before being sent to the local system under test. 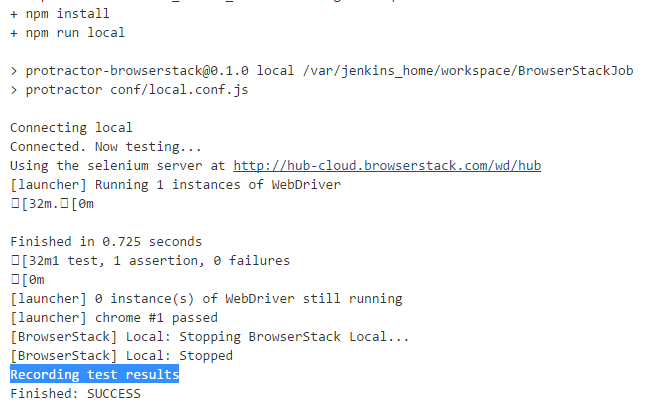 As an introduction, this part will show how to perform automated BrowserStack testing from the command line without the need to use Jenkins. 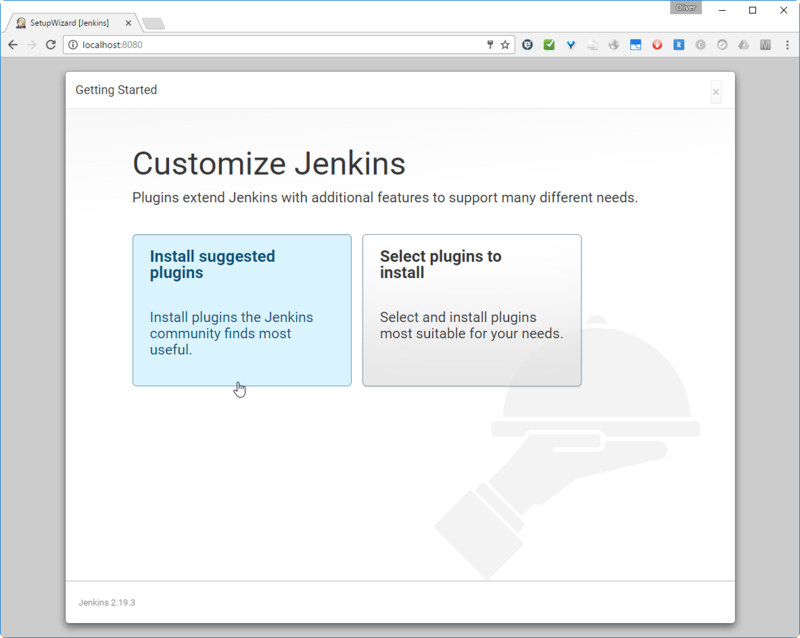 Part 1 of this blog post is not a prerequisite to run part 2, which performs similar steps (and more) in the Jenkins way. For completing the steps of this tutorial, you need to sign up for a BrowserStack account. Pricing information can be found here. However, for completing the tasks of this tutorial, I did not need to sign up for any of the paid plans. 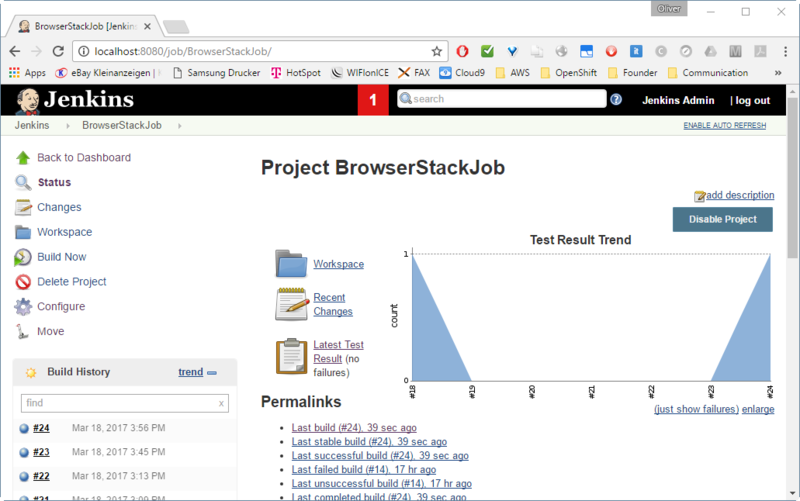 I have looked for a simple Protractor example and I have found BrowserStack’s Protractor example on GitHub. 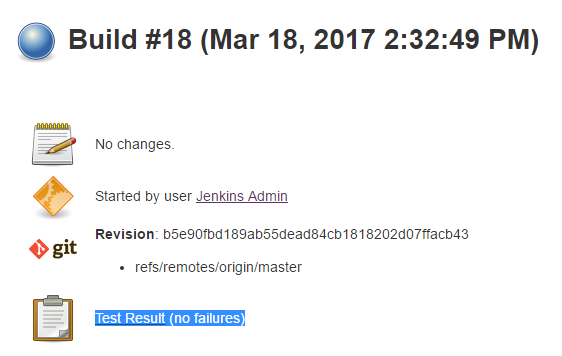 Let us run it on an Ubuntu 16.04 Docker container since the official Jenkins Dockerhub image seems to be based on a system that understands apt-get (see the Docker image layer visualizer). 0 upgraded, 179 newly installed, 0 to remove and 2 not upgraded. Need to get 79.4 MB of archives. Selecting previously unselected package libmnl0:amd64. Selecting previously unselected package perl-modules-5.22. Selecting previously unselected package libperl5.22:amd64. Selecting previously unselected package libffi6:amd64. Selecting previously unselected package iproute2. Selecting previously unselected package ifupdown. Selecting previously unselected package libisc-export160. Selecting previously unselected package libdns-export162. Selecting previously unselected package isc-dhcp-client. Selecting previously unselected package isc-dhcp-common. Selecting previously unselected package less. Selecting previously unselected package libbsd0:amd64. Selecting previously unselected package libnettle6:amd64. Selecting previously unselected package libhogweed4:amd64. Selecting previously unselected package libtasn1-6:amd64. Selecting previously unselected package libgnutls30:amd64. Selecting previously unselected package libxtables11:amd64. Selecting previously unselected package libroken18-heimdal:amd64. Selecting previously unselected package libasn1-8-heimdal:amd64. Selecting previously unselected package libkrb5support0:amd64. Selecting previously unselected package libk5crypto3:amd64. Selecting previously unselected package libkeyutils1:amd64. Selecting previously unselected package libkrb5-3:amd64. Selecting previously unselected package libgssapi-krb5-2:amd64. Selecting previously unselected package libhcrypto4-heimdal:amd64. Selecting previously unselected package libheimbase1-heimdal:amd64. Selecting previously unselected package libwind0-heimdal:amd64. Selecting previously unselected package libhx509-5-heimdal:amd64. Selecting previously unselected package libkrb5-26-heimdal:amd64. Selecting previously unselected package libheimntlm0-heimdal:amd64. Selecting previously unselected package libgssapi3-heimdal:amd64. Selecting previously unselected package libsasl2-modules-db:amd64. Selecting previously unselected package librtmp1:amd64. Selecting previously unselected package libcurl3-gnutls:amd64. Selecting previously unselected package libedit2:amd64. Selecting previously unselected package libstdc++-5-dev:amd64. Selecting previously unselected package xz-utils. Selecting previously unselected package gyp. Selecting previously unselected package libjs-node-uuid. Selecting previously unselected package libuv1-dev:amd64. Selecting previously unselected package node-async. Selecting previously unselected package node-node-uuid. Selecting previously unselected package node-underscore. Selecting previously unselected package libjs-inherits. Selecting previously unselected package node-abbrev. Selecting previously unselected package node-ansi. Selecting previously unselected package node-ansi-color-table. Selecting previously unselected package node-archy. Selecting previously unselected package node-inherits. Selecting previously unselected package node-block-stream. Selecting previously unselected package node-delayed-stream. Selecting previously unselected package node-combined-stream. Selecting previously unselected package node-cookie-jar. Selecting previously unselected package node-forever-agent. Selecting previously unselected package node-mime. Selecting previously unselected package node-form-data. Selecting previously unselected package node-rimraf. Selecting previously unselected package node-mkdirp. Selecting previously unselected package node-graceful-fs. Selecting previously unselected package node-fstream. Selecting previously unselected package node-lru-cache. Selecting previously unselected package node-sigmund. Selecting previously unselected package node-minimatch. Selecting previously unselected package node-fstream-ignore. Selecting previously unselected package node-github-url-from-git. Selecting previously unselected package node-once. Selecting previously unselected package node-glob. Selecting previously unselected package nodejs-dev. Selecting previously unselected package node-nopt. Selecting previously unselected package node-npmlog. Selecting previously unselected package node-sha. Selecting previously unselected package node-slide. Selecting previously unselected package npm. in the npm install step below; see Appendix A for details. remote: Counting objects: 185, done. Receiving objects: 100% (185/185), 28.39 KiB | 0 bytes/s, done. Note: this command requires ‘make’ to be installed. In the official Ubuntu 16.04 Docker image, this is the case. However, if it is missing in your case, you need to issue the command apt-get install build-essential as root or with sudo. Soon after running the first automated test via BrowserStack, I have found an Email from BrowserStack in my Email inbox with the information that they have noticed my first automated test and that I can contact them in case of any questions. 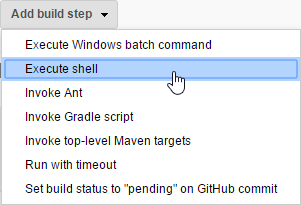 If you have a Jenkins Server that is up and running, you can skip this step, including the sub-steps. Note: I recommend to log out and log in in order to test the login. If you click on the , you will be informed that the BrowserStack user and password are available as environment variables. 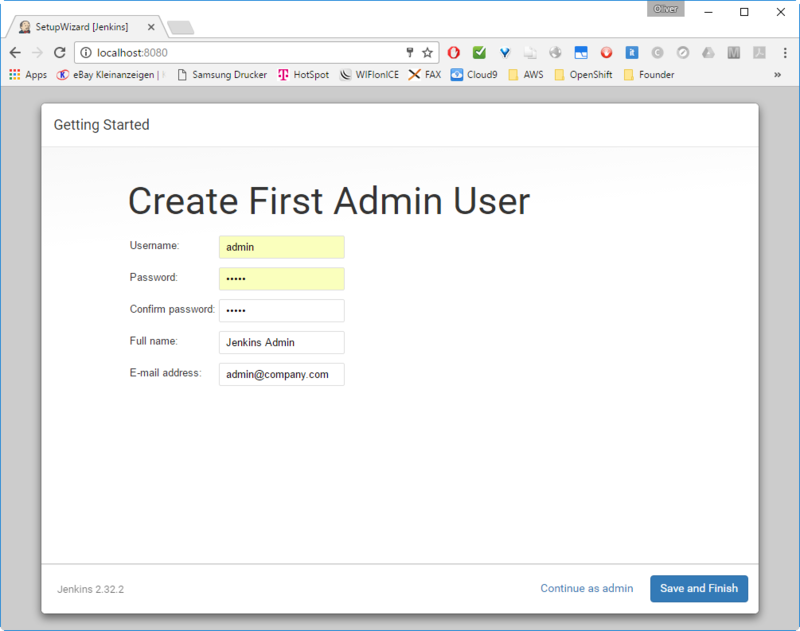 Select the BrowserStack credentials (username, access key) to use for this project. These values will be available as BROWSERSTACK_USER and BROWSERSTACK_ACCESSKEY environment variables. 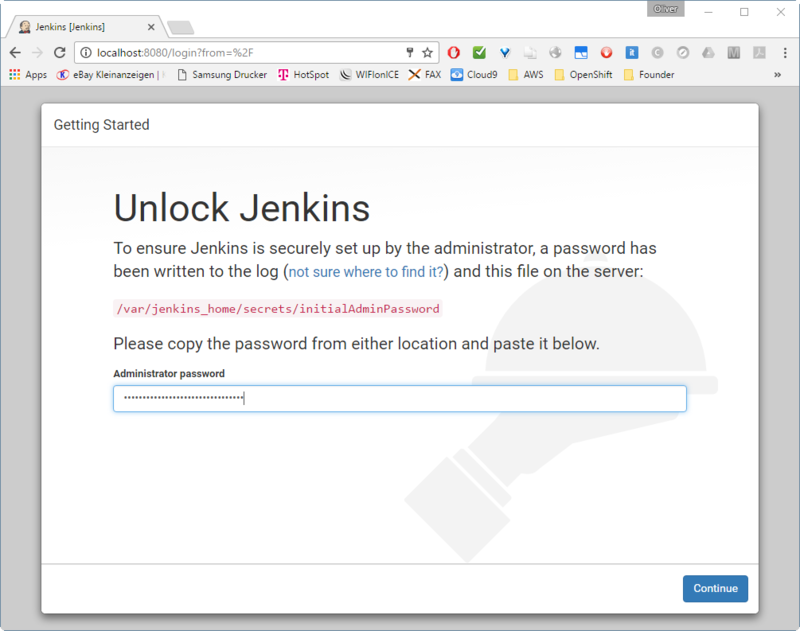 This is because the BrowserStack example expects the username and password to be provided in the variables BROWSERSTACK_USERNAME and BROWSERSTACK_ACCESS_KEY, which differs from the names the username and password are encapsulated by the Jenkins BrowserStack plugin. We needed to add npm install to download all dependencies before we run the test with npm run local. The local script is defined in the package.json file of the project. I have added a comma at the end of the protractor dependency line and I have added jasmine 1.0.0 to the dependencies. Note that the current jasmine 2.2.1 version did not generate any reports. The old syntax is throwing an error JUnitXmlReporter is not a constructor., if you use it with Jasmine2. With the new syntax, Jasmine2 did not throw any errors, but it also did not create any XML reports. 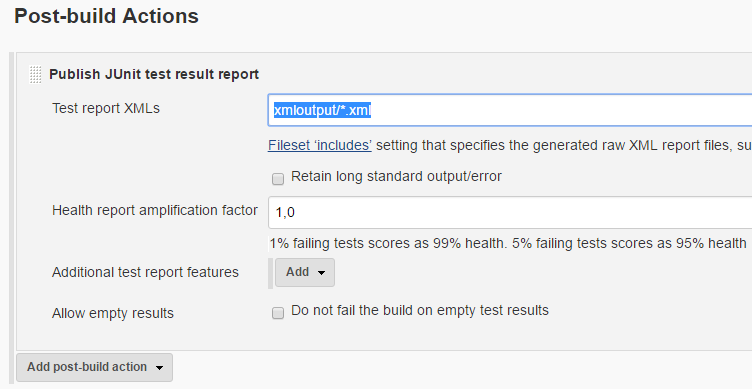 Just rerun the “Build now”, so you have at least two or better three tests with test results. Then the Test Result Graph will show up. This had caused a lot of confusion, because the number of the tests is shown to be zero, as can be seen in the graph in build #19 to #23. Then I have found Phil’s answer to this Stackoverflow question, which has helped me to resolve the issue by removing the aggregation. And voila, the number of tests is correct again (build #24). gyp ERR! command "/usr/bin/nodejs" "/usr/bin/node-gyp" "rebuild"
In the case of Ubuntu, there is an executable node on /usr/sbin/node that has nothing to do with Node.js. The problem is, that Node.js is installed as nodejs instead of node and that many NPM commands try to execute node. 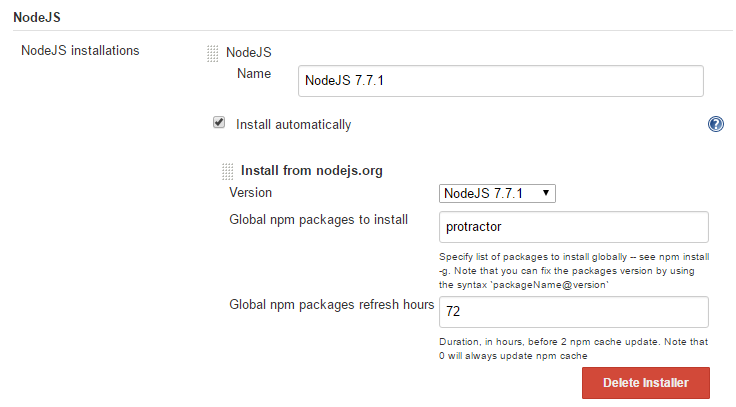 We need to make sure that the NPM installation commands will find the correct Node.js node. One way of doing so is to link /usr/bin/node to nodejs in the same folder. This works, since the existing /usr/sbin PATH is found behind the /usr/bin PATH per default. if you are root (we are root in the container above). If the other /usr/sbin/node executable is hiding /usr/bin/node, then you might need to adapt the PATH with export PATH=/usr/bin:$PATH. npm ERR! argv "/usr/bin/nodejs" "/usr/bin/npm" "run" "local"
npm ERR! Failed at the protractor-browserstack@0.1.0 local script 'protractor conf/local.conf.js'. The error indicates that the BrowserStack User and/or Password is not set correctly. I had hit that problem since I was testing another example with Gulp on the same system and the BrowserStack User and Password variables looked similar but were not exactly the same. This error was created with the Protractor Github example from BrowserStack with Jasmine 2.2.1 and Jasmine 1.x.x syntax (see below). This creates an “Error: TypeError: jasmine.JUnitXmlReporter is not a constructor”. npm ERR! argv "/var/jenkins_home/tools/jenkins.plugins.nodejs.tools.NodeJSInstallation/NodeJS_7.7.1/bin/node" "/var/jenkins_home/tools/jenkins.plugins.nodejs.tools.NodeJSInstallation/NodeJS_7.7.1/bin/npm" "run" "local"
See e.g. the accepted answer of this StackOverflow question. However, version 2.x.x did not create any XML reports in my case. This seems to be a known incompatibility with Protractor. Therefore, if you are using Protractor, I recommend to change the Jasmine version to 1.0.0 and keep the syntax in conf/local.conf.js in the version 1 syntax. See also Phil’s answer to this StackOverflow question, which has helped me to resolve the issue by removing the aggregation. And voila, the number of tests is correct again (build #24). to resolve the issue (hopefully…). At least, after that, the warning was gone. We have seen that BrowserStack can help to perform tests with many different browsers on many different operating systems and hardware without the need to buy and install any mobile equipment.